When you adopt a child from a country overseas, the UK immigration authorities require the paperwork to be translated into English from a recognised translation agency. 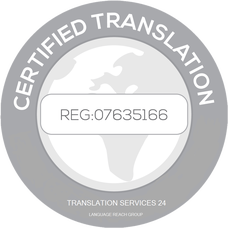 Here at Translation Services 24 we fully certify the translation enabling use for legal purposes. Our adoption paper’s translations cover over 300 languages, making us a leading UK provider of certified traslation services. To make an enquiry or to follow through with your adoption paper’s translation email info@translationservices24.com where a member of our projects team will respond within minutes. Our Adoption Translation is one of the many Certified Translation services we provide . We are able to translate standard adoption paperwork within 24 hours of receiving the document. You may scan and email over your document to save time. Once translated we send out a first class copy in the post which will be fully certified, stamped and signed by our management team. You may email your certificate over to info@translationservices24.com or alternatively give a member of our team a call on 020 8677 3775, we look forward to hearing from you.